A notice to vacate is a legal document issued in writing to the landlord, stating a deadline within which the tenant will vacate rental premises. A similar notice to vacate can also be issued by the landlord as per rules specified in rent deed to the tenant, giving in writing by the landlord to the tenant to vacant possession of the rental property giving a specific period and date to vacate. It is vital to issue the notice to vacate the rental property in writing to the landlord or the tenant to guarantee the legal validity, in case of dispute. When it comes to evicting a tenant who is not paying rent and not vacating in India, it can be a nightmare for a landlord. The landlord must give reasonable time to the tenant to check out of the rented property by serving a written notice to tenant for vacating, drafted properly according to rules with help of a property lawyer. Who can use this notice to vacate format? The notice to vacate format can be utilized by the tenant of a rental property, serving a notice to the landlord as per the rental agreement if the tenant’s intention is to vacate the rental premises before the end of the tenure. The tenant of the property need to duly sign the document and send the document through registered post or can give by hand and acquire the receipt of an acknowledgment from the landlord for the same. 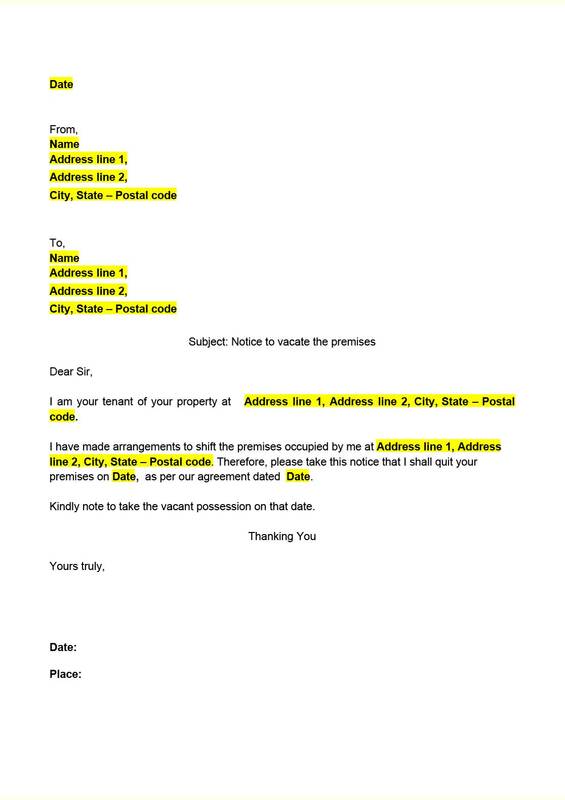 A written and acknowledged notice to vacate can be utilized as evidence in the court of law of the state, in case of a dispute relating to the rental property. The rental laws in India help a landlord in evicting their tenant only if there is a justifiable and valid reason like a tenant has intentionally not paid mutually agreed rent amount defined in the agreement made for more than 15 days or a month from the due date, the tenant has sublet the rented property to another person or he may be miss using it, the landlord requires their property for own residential purpose or for any family member or any other genuine reason. The grounds for vacating the property must be justifiable under the State’s Rental laws in which the property is located. The tenant, who wants to vacate the property before the completion of tenure, must issue a notice to vacate. It can be printed on a plain white paper and duly signed by the tenant. The document can be sent through registered post. However, it can also be given by hand to the landlord or sent through email. 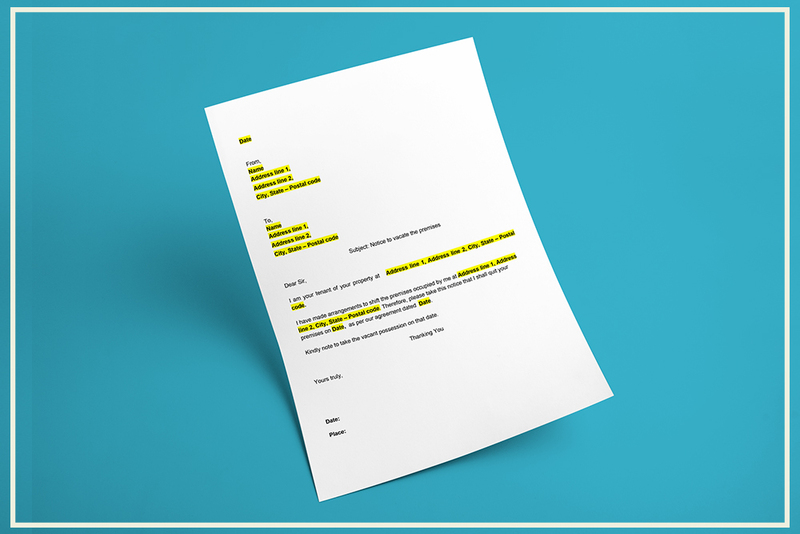 If it is sent through email or hand delivered, it is vital to receive a proper acknowledgment receipt. Once the landlord receives the notice, he /she can agree to the request or suggest an option to continue. In case the notice is given by the landlord then the date should be suggested as per rules and defined in the agreement. The process is same as required by the tenant for making the notice to vacate.